Patty's Utopia: Reasons Why You Should Not Miss the SAM Remix on October 25th, 2013. Reasons Why You Should Not Miss the SAM Remix on October 25th, 2013. 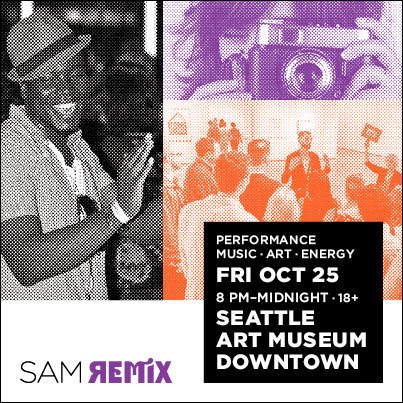 The Seattle Art Museum has hosted the recurring event, SAM Remix, for several years now, and what makes the remixes so especial is the combination of music, fun, and art all under the same roof. The next remix will happen this Friday, October 25th from 8pm - 11:59 pm at the Seattle Art Museum. You will have the opportunity to visit the exhibition "Peru: Kingdoms of the Sun and the Moon." Part of the live music will be provided by, our very own Grammy Award winner Carlos Cascante y su Tumbao. Arts and crafts will include: Creation of knot necklaces with designer Rachel Ravitch, inspired by quipu (knotted-cord records) from the Peru exhibition. Cosmic face painting by makeup artist Angie Glasser and Rashawnda Fitch, and construction of wicked or whimsical hats with artist Alicia Betty. Capture your fun and excitement of the night by posing for images solo or with friends with photographer Megumi Arai. I hope you join me on this cosmic night filled with Latin rhythms, as I do a live guest-tweeting for the Seattle Art Museum from 10 - 11 pm! Prices are: SAM members $12. Adults $25. Students $20. Tickets may be purchase online, at the Ticketing Desk at any of SAM's three sites or over the phone with a credit card by calling the Box Office at (206) 654-3121. Print at home tickets are strongly recommended. This event is 18 and older. For all of the Twitter lovers, make sure you follow the Seattle Art Museum's Twitter handle (@iheartSAM) on the night of the event. I (@UtopiaMediaEnt) along with three other great twitter users, will let you know of all the fun, and cool things happening during the night by using the hashtag #SAMRemix. One more thing, because this remix is right before Halloween, costumes are encouraged but please, no masks.